This is Jordy from Chi Chi Memories' Beach Time set. 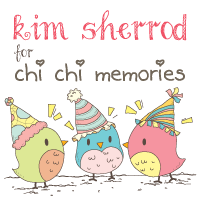 There's still plenty of time to grab this set and make fun cards or scrapbook your summer memories. I wanted a fun and bright card hence these bright colors. I colored the image in using Copics and the blue matting is done using a Spellbinder die. I popped up the image and blue matting with 3-D foam tape. The gingham ribbon is from my stash that I've had for years from CTMH. Finishing off is an orange button adhered to the top of the bow with a large glue dot. Such a cute little guy who looks as though he is having some summer fun. Thanks for joining us at FOSTV this week. Sorry to hear about your cat - such a tough one. Such a sweet card, the image and how you colored it makes it so precious! 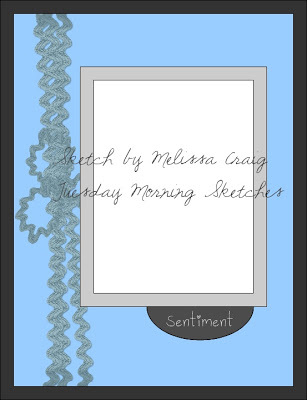 Thank you for using our sketch this week at Tuesday Morning Sketches! I'm so sorry about your kitty :( 18 years is amazing, but it is never long enough, is it? You have my sympathies. Your card is so cute!! I love the gingham ribbon! Hi Kim! How are you? Your card is so adorable! That boy looks like he's ready to ride the waves on a snazzy board! Thank you for joining us at Tuesday Morning Sketches. Nicely done, thanks for playing our challenge at 4 Crafty Chicks, great job! Fabulous image and wonderful clean and crisp layout! I love the image and the way you colored it. Great boy card. Thank you so much for sharing your amazing creation with us at 4 Crafty Chicks.